Steer Behavior (beSteer) adds a goal to flock Entities in addition to Flock Behavior. For more information on flock concepts, see Flock Locator. This Behavior needs to run in parallel with a Flock Behavior to define flock navigation. See how to properly handle dual Behaviors here. All Steer Behaviors are stacked according to their weight, which allow to flee some targets while seeking others. For wander mode, as no target position is available, a constant Weight can be given to the wander effect. For seek or flee mode, the weight can be further tweaked to be decreased (or increased) when boids are far from target. from 0 to Min Distance, for seek mode only, weight will be linearly interpolated from 0 to Weight At Min Distance, else Weight At Min Distance will be used on all range. This is meant to preserve a natural flock volume, else the boids would tend to crowd around target. Default values define a Max Distance to 0, so that Weight At Max Distance default value 1 will be used at any distance, insuring that a single Steer behavior freshly dropped will behave as intended. Final boid steering = ( weighted mean of Steer Behaviors + Flock Behavior output + steering to Flock Locator center if outside of the locator radius ), constrained by boid properties (mass, max force, speed). A steer Behavior defines the following target attributes.For common attributes see Behavior Common Attributes. Wander : the Crowd Entities just wander around : they pick a random value in the space and pick a new one when reached. If this mode is selected, all entities will try to reach slots on the Crowd Target Locator selected in the "In Target Poptool" field. If this mode is selected, each Entity will be assigned to its corresponding particle in the target particle system selected in the "In Particle System" field (i.e. entity of particleId 1 will be assigned to the target of particleId 1…). If the target particle system contains fewer particles than the navigating Entity, the entity particleId will be moduled by the size of the target particle system (i.e. entity of particle 6 will be assigned to the target of particleId 1 if the target particle system has 5 particles...). 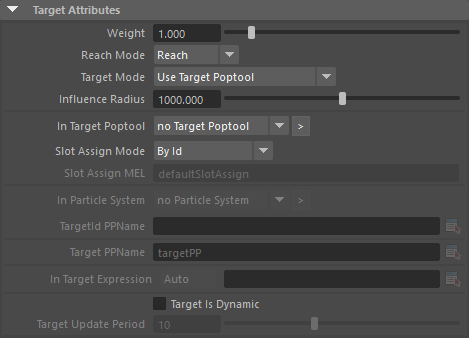 Note that Golaem Crowd Population Tool can be used to emit the target particle system. It is also possible to specify the assignment of each Entity in the targeted particle system thanks to the field "Target Id PPName". If this field is set, each Entity will be assigned to the target whose id is stored in the float per-particle attribute stored in the "Target Id PPName" attribute of its relative particle. If this field is not set, or its value for one Entity is negative, the particleId will be used. See ppAttributes Handling. If this mode is selected, each Entity will be assigned to the position stored in the vector per-particle attribute stored in the "Target PPName" attribute. The Y value of this per-particle attribute will be projected on the terrain. See ppAttributes Handling. If this mode is selected, the target comes from an expression evaluation. A helper provides the special names to use entity data. The radius around target, inside which the target has an influence. Indicates if the target must be evaluated once or based on target update period. Defines the Force Behavior Visual Feedback displayed in the Crowd Visual Feedback and inside the viewport. For common Visual Feedback attributes see Behavior Common Attributes. Enable or disable the display of visual feedback.